Now is the greatest time in human history to become a self-made millionaire-and I can show you how. Make a Million will show you that it's not only possible to build financial freedom and a healthy bank account...it's easier than you think. This program is filled with the best ideas and strategies for creating and maintaining wealth. I've used them myself, and have recommended them to countless others who were serious about saving and making money. And each of them had to learn the basic skills I will teach you in this program. Once you've mastered the income boosting techniques, you'll be one step closer to realizing your financial dreams! If you're in your 20s or 30s, now is the ideal time to start planning for retirement. And if you're in your 40s, 50s or 60s-you haven't missed the boat to plan for the rest of your life! Through my decades of studying hundreds of successful entrepreneurs, I've discovered what they all do to stay on top. In this short program, you'll get the BEST methods and strategies to achieve your personal financial goals quickly and easily. You have nothing to lose...and MILLIONS to gain! Turn Your Dreams of Being Financially Independent and Wealthy Into Reality...Order Make a Million Today! If you're not listening to this message then you're missing the whole lots of things to have a better financial perspective in your life. In January, I dusted off many of my Brian Tracy programs and even ordered some more. I had many in my possession for as many as 7-8 years and hadn't really listened. As of right now I am earning 30% more this year than any year in my 13 year history with my present company. In addition, I started what I affectionately call my "Brian Tracy 50% account" where I am taking 50% of my "extra" earnings and putting them into an account to be used for savings, investments, etc. I literally wrote on the bank book "Brian Tracy 50% account". I am finding more opportunities to spend time with friends and family and more opportunities to make more money at the same time. I gave my father "Make a Million" to listen to and he is on an appointment as I write this, which he had put off for months, but could conceivably yield hundreds of thousands of dollars in income. Thank you for your material. I look forward to more great results. 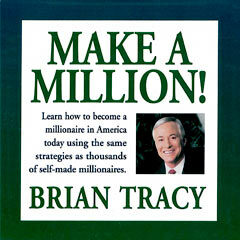 In Make A Million Brian provides clear, practical advice on how to get ahead financially. It is well worth it.